In a recent two-part discussion with Banphot on The Money Channel, my business partner, Paul Gambles, discussed their own particular assessments of the state of the America, turning to the political risks and issues. They both saw the annual State of the Union speech on TV for the American people, but we actually read an alternative State of the Union by Nouriel Roubini, the economics professor, who put something together that, for me, is a much better description of the State of the Union of the United States at the moment. He described what he thought were seven major problem areas whereby American economic performance is really just papering over the cracks, and what we are seeing is just hiding all the problems that are underneath, and it is actually a lot of things that we have been saying for some time now. He was talking about the fact that there is a USD15 trillion debt that is just not going away, and what is more, there is a deficit every single year as well, so that debt is just increasing. Like us, he does not really believe that American economic performance is picking up even though we saw some better numbers coming through for some of the Q3 and provisional Q4 results. However, please remember we had Operation Twist in the second half of last year, and that really forced a lot of stimulus and put impetus into the economy. It came with a very large cost as well with all this long-term debt being swapped for short-term debt, but it did have an impact on the economy. To us that is not real growth; it is a one time benefit. Unlike QE, I think the benefit of Operation Twist was that it had an impact on the real economy rather than just on financial assets. It is better than QE but it still has the same fundamental problem, which is that the first time you do it, you get quite a big impact, but after that, you always get diminishing returns, so they might do a second Twist, a third Twist, etc. They are still talking about QE3. They mention buying residential mortgage-backed securities, and commercial mortgage-backed securities. They are considering all these alternative forms of stimulus but the problem with all of them is that even if they do have a positive impact, it is inevitably decreasing. There is no doubt that QE1 had a positive impact on the financial markets. However, it did not have the same impact on the economy that it did on the stock markets. QE2, though, had a much more limited impact over a shorter period of time, and we think that QE3, therefore, would not be so great, and then QE4, QE5 even less so. Eventually you end up having no real impact at all. We might get a second and a third Twist, but each time the impact will be smaller and smaller. We do not really think that these things are in any way a fix, and again we agree with Nouriel Roubini in that the real problem is still there. Roubini describes all of this as two kinds of deficit problem. One is that there is a stock problem, i.e. there is USD15 trillion of debt already on the US federal balance sheet, and you have to do something about that because the cost of servicing that debt does not go away - no matter how much you want it to. The second problem is what is called a flow problem, i.e. are you actually paying off that capital every year or are you really increasing it? Well America has both problems; it has a huge amount of debt, approximately 100% of GDP, and it is getting worse every single year, and no-one really seems to have come up with a solution to that. In America, a lot of the State of the Union was political posturing; it was Obama putting himself in front of the American population as a great advert for a re-election campaign as voters have to go to the polls at the end of the year. We have got a choice in the States with a Democrat party that believes in raising taxes for the very rich, which we agree with - it needs to happen. Income in the States is so badly distributed that it is all sticking in the top echelons. It is not circulating into the economy. This also applies to companies as well. The money is just stuck on corporate balance sheets, and corporates are not employing people, so again it is not circulating; it is not having any economic utility. As reported by Deloittes, this is confirmed by the fact that big companies have built up substantial cash reserves in recent years. The pace of the economic recovery depends on what companies do with these cash piles. The numbers are striking - US corporates collectively hold USD1.73 trillion in cash. As a share of total assets held by non-financial companies, cash holdings are at the highest level in more than half a century. This is not just a US phenomenon. UK non-financial companies' cash holdings stood at GBP731.4 billion in the third quarter of 2011, the highest level on record. High levels of corporate cash reflect the success of big corporates in controlling costs and rebuilding profits in the last three years. In the US the share of profits in GDP stands at a 50 year high. While big corporates are profitable and cash-rich, governments and consumers in Western economies are, by and large, short of money. If Western economies are to grow over the coming years businesses will need to do a lot of the spending. Corporates have proved more willing to pay out cash to shareholders, through dividends and by buying back their shares. Now is the time they should start spending on growth but they will not when there is no clear guidance from the top. Recently, my business partner, Paul Gambles and AEC Group’s Carey Ramm gave AustCham members a lively debate about the health of the Thai, Australian and global economies. Carey gave a very well-informed view of where the Australian economy is right now, whereas Paul took more of a look at what is coming down the track. He used the four seasons Kondratieff chart that has been a reference point in presentations by MBMG Group and MitonOptimal over the years - it is also well known to regular readers of this column. Interestingly, MitonOptimal’s institutional asset allocation expert, Professor Evan Gilbert, also used the same chart in his Global Weekly Comment the very next day - great minds think alike! We have written several pieces in the past on the need for flexible rather than static asset allocation in a world that evolves over time. To successfully implement such an approach you need an investment process that allows fund managers to position themselves reliably for these changes before they happen. MitonOptimal believes it has developed such a process. The process they use involves taking positions on two levels - the strategic and the tactical. The strategic position reflects their long term perspective on the likely performance of asset classes over the next ten year view. This view is then implemented through the specification of their (risk) neutral asset allocations. We recently discussed some of the changes to these allocations. They form the centre of gravity for MitonOptimal’s portfolios, but they also recognize that long term conditions are not always perfectly reflected in the short term. That is why they allow for deviations from the neutral risk position to reflect the current environment. They also spend a large amount of time thinking about how to optimally implement the desired asset allocations. These are their tactical positions. The whole process starts with the strategic position so it is very important to have that right. Miton often gets its guidance from the Kondratieff Seasons chart. As pictured on this page, this is a cycle describing different stages of inflation, interest rates and economic growth for national economies, and their concomitant influence on financial markets. Where are we now? Miton believes that some emerging market economies (China, India, South Africa and Australia) lie in the Autumn phase - at about two o’clock. While prices of almost all assets rise in this environment, the future is not rosy - winter is coming as debt levels start to build in these apparently benign conditions. Developed markets have been suffering through winter in the last four years and it is not quite over yet - Scott Campbell, Chief Investment Officer at Miton, sees them at around five o’clock. It is expected for them to move into the Spring phase in the next five to ten years. This is the basis for Miton’s increased allocation to equities and decreased allocation to bonds as bonds are now entering into a bear market. The Miton strategic positioning is fundamentally for Spring, but they are also very conscious of the onset of Winter in emerging markets - and that is what is going to guide Miton’s tactical allocations. What I would add to this is that ASEAN markets entered into the winter phase in 1997 and took remedial action that has seen them already return to Spring - however, the early days of this season will be a particularly cold as chill winds from Western and Japanese winters blow through these markets. Tim Price of PFP Wealth Management’s recent missive entitled “The final countdown” had the following to say on European policy errors: “Nassim Taleb (author of “Fooled by Randomness” and “Black Swans”) shows how the efforts of our authorities to suppress volatility actually end up making the world less predictable and more dangerous. “Although the stated intention of political leaders and economic policymakers is to stabilize the system by inhibiting fluctuations, the result tends to be the opposite. These artificially constrained systems become prone to “Black Swans” - that is, they become extremely vulnerable to large-scale events that lie far from the statistical norm and were largely unpredictable to a given set of observers. The firefighters in Australia, South Africa and elsewhere would all agree with this. By continually suppressing small fires they are unwittingly creating the conditions for larger and less containable wildfires in the future. The fire service in any country area is a vital necessity to ensure the wellbeing of all homeowners and other residents. However, all country folk have come to understand that fires are a normal and healthy element of a forest ecosystem and constant intervention will worsen, not help the process. Can someone please replace Western central bankers and politicians with these clever country folk as the interference of governments desperate to stay in power has not helped one iota. In a perfect world, a central banker who wishes to end a depression with the economy returning to normal prosperity should follow the following motto: Don’t interfere with the market adjustment process as it only fans bigger problems. The more the government intervenes to delay the markets adjustment, the longer and more grueling the depression will be, and the more difficult will the road to complete recovery. ASEAN will still be the healthiest region in which to invest but the best opportunities will come when markets are significantly below their current levels. These are markets in which patience and stock picking are most definitely the virtues to believe in. There are also some good fixed interest/income funds offering in excess of 8.00% which may appeal to the more cautious investor. However, if you do not want to tie your money up for any length of time then remember our old mantra of, above all, remaining liquid. 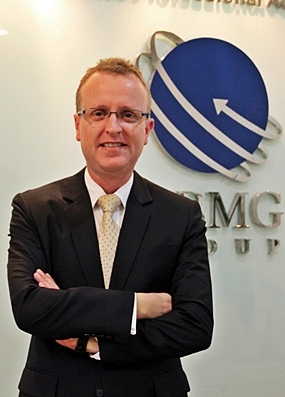 MBMG Group, Thailand’s foremost financial and legal advisory for expatriates, has expanded its general in-house expertise and specialist services for Australian nationals with the appointment of Nick Morton as a senior private client advisor with immediate effect. Morton is a certified financial planner and a member of the Financial Planning Association of Australia, the highest professional designation available to Australian financial planners. He also holds an Advanced Diploma in Financial Services. His 14 years experience in the financial services industry includes service at BDO Kendalls practice in Australia. Most recently, Morton was a senior private client adviser with ipac Singapore where he managed a large and diverse client base of high net worth clients for three years. MBMG Group Managing Director Graham Macdonald, said, “MBMG Group and the high-level services we offer to Australian expatriates have been further enhanced by Nick’s appointment to our team. In his spare time, Nick is an avid follower of Australian football and enjoys travelling throughout the region. How can anyone have any faith at all in the so called ‘technocrats’ to resolve Europe’s problems? After watching CNBC's Michelle Caruso-Cabrera interview Greece's new prime minister, Lucas Papademos, our reaction to the unfolding situation with Greece and with the Euro as a whole was stunned disbelief. There are a million people in Greece living below the poverty line who are actually starving on a daily basis, and Papademos sits there and says, “We need this adjustment process, and yes wages are going to fall, but by the end of it we'll be okay.” This is a multi-year process. For Greece to become competitive is probably going to take five to ten years - at least. The people are not going to go along with it. They have been promised early retirement and lavish pensions. These are now nothing more than pie in the sky. The Greeks would not have gone along with it even if they had elected the people in charge of it. We have been saying this for a period of time, and it is going to be painful in the short term which is why politicians do not want to do it, but the only way out for Greece is to leave the Euro. People wonder exactly how this will happen as there is no provision for this type of scenario in the European constitution, but the EU does not have a constitution any more. It was torn up and buried on December 9th by Germany and France. The EU has no legal mandate. Greece should actually just leave. It should re-introduce the Drachma and Drachmatize the Euro debt. There are actually two really good play books for this. We were all here in Asia in 1997. We saw what happened. Yes, it was six months of pain, but it was a pretty sharp recovery after that, and South East Asia has done very well. ASEAN is in the situation today where it does not have debt problems. But there is actually an even more current example and it is a European example. Iceland. It devalued its currency, and yet Iceland had one of the strongest growth performances of any economy in the third quarter of last year. Iceland has started to adjust. It has not got anywhere near as far in adjusting yet as it needs to, but it devalued its currency and because of that it is starting to write off debt and assets, and actually starting to grow again. Iceland grew at 3½ percent in quarter three so it, at least, seems to be at the start of a path to recovery. What we are seeing now is a situation where everything is politically driven. The dynamic is that Germany is now in charge of the cheque book. That is what happened on December 9th when we got an agreement that everything can be done in bi-partite deals now. If you need to borrow money, you go to Germany, and it is Germany who sets the conditions that will apply. In our office, we have actually stopped referring to Angela Merkel; we now refer to her as Alaric Merkel. Alaric was the king of the Goths, who in the 5th Century marched on Athens, didn't get into a war but surrounded Athens and starved the city into submission, and then from there, in 410, he marched on Rome, surrounded Rome and starved Rome into submission. To me that is what's happening in the Eurozone right now. We have got Germany dangling the cheque book, calling the shots, making all the threats. But how long will everyone else go along with this? So the current offering of 3% on 20 to 30-year bonds is really a bribe. It is an iron fist inside a velvet glove. What are the options if you don't? I think we are getting very, very close to the point where private investors are going to look at it and say, “You know, on a net present value basis, we need to just repudiate that debt.” So far, they have sort of pushed them along step by step, and they are getting closer and closer to the line in the sand; in fact they are probably re-drawing the line in the sand as we speak, so it is very hard to say the point at which they are going to turn around and say “enough's enough”, but we are getting close. There are clear signs. Look at the CDS markets and everything they are pricing in. Not only that - there is so much distrust in the Eurozone. We have been saying for some time that the key figures for 2012 are TED (T-bill & EuroDollar) and LOIS (Limit Order Information System). As the TED spread shows, no-one wants to take the risk of lending dollars. And with LOIS, the Overnight Spread, nobody wants to be the one who is lending money to other banks, and that is precisely why there is so much money parked in the ECB every single night. This money is not circulating, which is incredibly bad for the global economy, but it is also a sign that we are getting closer and closer to a terminal event. If you look at the TED spread and LOIS, they have gone from normal levels of around ten basis points, up to around 50 or 60 basis points. Over the last month or so, they have eased off, but we are closer and closer to capitulation. We are getting there, whether it is this week, this month, or six months from now, we are getting there. How far they can kick the can down the road we do not know, but the end is getting closer. Last year has fulfilled general expectations for the Australian Dollar and economy and for the global economy. Although the Australian Dollar - high against the US Dollar - slightly exceeded expectations, our limited hopes back in January have been almost exactly met. So, what exactly did we expect in 2011? Overall a continued battle between risk-on and risk-off, with the start of the year still driven by the positive momentum of QE2, driving global risk asset markets higher, supporting commodity prices and weakening the US Dollar. All three of these factors are supportive of the Australian economy, Australian equity markets (which are now dominated by resources and the banking sector to an unprecedented extent) and the Australian Dollar. However, the events of Q3 last year (which had really started to surface almost six months earlier) showed us that what the carry trade gives it can also take away. The sharp snap back below parity was a stark warning of what can happen to the AUD when the problems that have dogged the global economy for over a decade finally flare up in a way that short term measures can no longer smooth over. This should be seen as a warning shot with downside risks of the Aussie sliding below 65 cents in extremis (although the jury is split as to whether that’s more likely in 2012 or 2013). Further US and European QE and interest rate manipulation, such as the Fed’s much vaunted ‘twist’, undoubtedly bought more time, delaying the grim days of reckoning, whilst making the ultimate problems more severe. 2012 still seems the likeliest ‘red alert year’, although noted economist, Professor Nouriel Roubini, believes that the central bank masters of the universe can buy another year before reality bites. The challenges facing the global economy largely stem from the inefficient allocation of resources and wealth across developed economies as a whole over the last three to four decades. This created the unprecedented debt bubble that hangs like a dark cloud over the global economy from America to Zimbabwe. A second phase of the crisis is likely to see the decoupling of economies like ASEAN which has low levels of external debt and healthy balance sheets as a result of the post-1997 period of adjustment. The gorilla in the room remains China whose politicians have yet to decide how to handle the imminent slowdown. Will they take pain on the chin and encourage a period of adjustment as a pre-cursor to further growth? Or will China’s politicians copy Western mistakes of ‘extending and pretending’ putting off the inevitable but making it much worse in the process. China, the last driver of global growth, holds all the aces in this round table discussion. What we expect with a reasonable degree of certainty is that the onset of crisis will provoke the fall in AUD, referred to earlier and a sharp correction in the ASX, where a ‘three handle’ seems inevitable. We thought we could have got there in the last couple of weeks of 2011. Any global slowdown will seriously depress commodity prices, further squeezing the Australian currency and economy. A sustained correction in Australian property prices - now the singly most overvalued property market - will take place over several years. Although the severity will vary from region to region we expect WA along with the Gold and Sunshine coasts to be the worst affected. Residential properties could ultimately see falls exceeding 30 percent. Australian currency, property and equity markets might not revisit recent highs again for many, many years. This is not a typical, cyclical event - the global economy, the Australian economy and global and Australian equity and currency markets are undergoing a seismic shift that has been coming down the line for over a decade. It has been looming larger and closer since the credit crunch and Global Financial Crisis but it is now inevitable. The only real questions are how quickly will each part of the world recover and what will the world look like afterwards? China’s longer term growth potential remains the key to Australia’s bright, long term future but for the next few years the lucky country’s resources-dominated equity market, overheated housing market and carry-dependent currency appear to offer meagre rewards in return for a risk element that goes off the scale. Expat Aussies with a range of international currency, investment and deposit choices can position themselves very nicely to make the most of the opportunities that will inevitably arise from such dislocations much more easily than the countrymen that they have left behind back home. Expect periods when the best results come from staying well away from Australia’s equity and property markets, holding very little more than an emergency reserve in AUD and working in the faster recovering, less indebted markets of South East Asia. Aussies who can do that might turn out to the really lucky ones! Advance Australia? If it can stop still they will have done well. We have just completed our annual review of our neutral strategic asset allocations and, basically, the executive summary is that we have increased our core fund’s neutral global equity exposure from 30% long and 10% long / short upwards to 35% and 10% respectively thus giving a total of forty five percent. This is at the expense of Government Bond exposure, which we have now reduced from 15% to 10% on a long term neutral basis. Whilst the move may appear small it will have a material impact on the tactical asset allocation moves and risk management within the overall portfolio on a daily and monthly basis. This comes from an annual review based on our expected ten year forecast returns optimized within the portfolio. It is important to know that it does not change very often. The neutral long global equity exposure was effectively reduced in 1999/2000 from 50% to 30% and has remained there until now. We have always believed that strategic asset allocation is not static asset allocation based on averages, but is driven by asset class valuation. We see risk in terms of making absolute not relative returns. An efficient frontier portfolio based only on historical standard deviations alone would have produced the same static allocation for global equities for the 1990s and 2000’s. However, in one decade the S&P produced 400% returns and the other 0%. No further explanation is needed. For those who have not read GMO’s James Montier’s white paper entitled “I want to break free or Strategic Asset allocation # Static Asset Allocation” please contact me for a copy as it explains this whole subject much more clearly than I ever could. Valuation of asset classes matters greatly. The chart below from GMO’s report illustrates the point very clearly. For global equities (using S&P500 as proxy) if your allocation when PE valuations are 20-48 times ten year average earnings you can expect 2% per annum real returns as against 10% per annum real returns if you buy on PE multiples of 5-13 times etc. For Government Bonds, if you buy at a starting yield of 2.8% on 10 year US T Bond you get 0% real return on a 10 year view versus buying at 7.6% yield equals 4% real returns for the next 10 years. Go figure. Whilst global earnings still reflect the highest profit margins in multiple decades, and the European Debt crisis is far from solved, we believe the ten year expected real returns are very close to the left hand axis in each chart above and a Strategic Asset Allocation shift is required. In conclusion, global equities are much better value than they were ten years ago, government bonds offer terrible value with zero real return, if not negative on a 10 year view and gold has nearly achieved its valuation target but is probably not quite there. For our cautious to balanced portfolio to have had the same benchmark asset allocation to any of these asset classes over the past twenty years is ludicrous, but that is what most efficient frontiers produce. The standard deviation remains the same but the returns vary wildly. As stated before, no further explanation is required. Basically, when it comes to funds there are lies, damned lies and statistics. Rather than drown yourself in figures that are produced by the people who want you to buy their fund, look at independent research and select the funds you feel comfortable with and match your own investment requirements - especially when it comes to risk/reward ratio.